8334 kilometers or 5179 miles, that’s how far the drumeo studio is away from where I live. That’s the distance between Abbotsford in Canada and Munich, Germany. However I bet for most people who are familiar with drumeo the way is equally long. That’s because drumeo is an online drum lessons website, which has thousands of students from all over the world. You might be one of them? 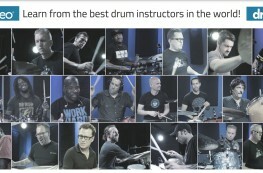 There are not only many, many students, the list of drummers who already gave a lesson at drumeo is long and impressive. Take this: Kenny Aronoff, John Blackwell, Peter Erskine, Benny Greb, Thomas Lang, Bernard Purdie, Tony Royster Jr. and many more. On top of them all stands founder and Best Drum Educator 2016 – at least to Rhythm Magazine – Jared Falk. Back to the distance from me to the studio … Earlier this year I missed Jared at the NAMM Show in Anaheim. 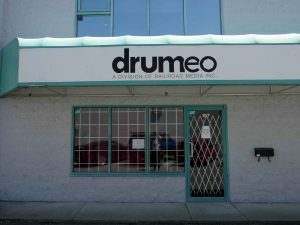 But when he kind of invited me to come by at drumeo, I thought: “Yes, I’d love to see that place for real.” Only five months later I am there. I wished it always would take me only such a short period of time to go to the places on my “to-go-list”. Of course I didn’t fly all the way for a two-hour meeting. But as chance would have it, this year’s summer vacation took me to Western Canada. So who is Jared Falk, this tall guy from Canada who saw the potential of teaching via the internet before most others? The man, who didn’t want to join his father’s construction company, but instead sold hockey cards on the internet and taught kids how to play drums. I was curious about that and arranged an appointment at the drumeo premises. As always it’s impossible to cover everything. On the one hand everybody has only so much spare time, on the other hand I’m into background stuff that hopefully hasn’t been covered by somebody else yet. Thus I prepared 15 questions. Let me spoil this: Jared won’t tell you about the many names on the wall behind him, I will. Those are the names of the people who helped Jared to get started through crowdfunding some years ago. Guess what?! Most of them are still students at drumeo. 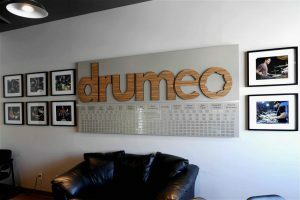 So I received my private tour through the drumeo facilities and met every one of the team, as well as some diligent students. 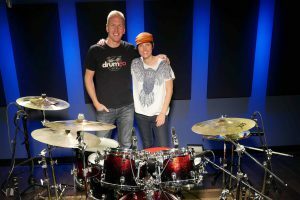 It didn’t take me by surprise that I was surrounded by highly motivated, friendly and outspoken people, as I am used to experience that around drummers. After my tour I was free to everywhere and film anything – that’s not something I take for granted, but I am very thankful for it. If you would like to know both the questions and the answers in detail, just watch the video. I promise, you’ll get something out of it. 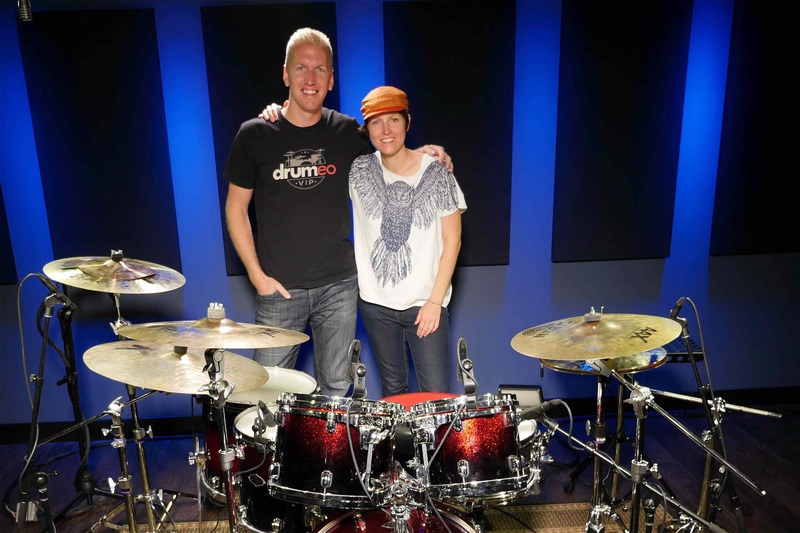 Find out how important an individual mission statement is, how Jared got hooked on drums, why he started drumeo, which drummers’ lessons he still practices, why a teacher also needs to keep progressing as a player and what he wants so bad from Carter Beauford. In case you are wondering, why Jared and I don’t appear together in both the intro and the outro, it’s because for this trip I packed lightly. Or rather my suitcase was already full and didn’t fit all of my equipment. Lucky me, Jared offered to be my personal tripod and cameraman. I accepted and now it’s about time for you to watch the whole thing. Enjoy! Thanks a lot for this one, I really enjoyed watching it. I also think its a good idea that you now include the questions you have asked. You are also welcome for this one 😉 And as always: THANKS for your feedback. Good to know.